Home→Remembrance of a Requiem : The White Plains Candlelight Walk September, 2001. 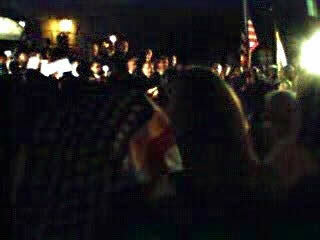 Remembrance of a Requiem : The White Plains Candlelight Walk September, 2001. Editor’s Note: It happened at 9:11 A.M., 17 years ago. The shock of that day lingers always. White Plains like America struggled to pay tribute to the lives lost that day, the thousands who tried to save the Americans plunging to their deaths, the first responders trapped by collapsing buildings. White Plains was no exception. A week afterwards, the city held a Candlelight Walk to remember the 3,000 lives lost. The injured, the forlorn at their loss. I was there. This is my account of that walk. Seventeen years ago, White Plains held its remembrance of this horrible day when the World Trade Center was ruthlessly diabolically, destroyed, taking the lives of over 3,000 people, with the toll still climbing daily for weeks as its spawn. Seventeen years this coming week is the observance of the White Plains Candlelight Walk — an event organized to help the public of White Plains do something, come to grips with the Trade Center genocide. The Candlelight Walk was a public outpouring of emotion that put into perspective how the events that took place 9/11/01 ripped us apart and brought all Americans of every race, religion, creed and origin together for a short time, a very short period of time — judging by the Presidential campaign of prejudice, class warfare and labeling now in full swing. Police estimated a crowd approaching 8,000 persons gathered at the White Plains Railroad Station who marched shoulder to shoulder, Black to White, Hispanic to Hassidim, Italian to Jew, Arab-to-Asian, Old-and-Young, American-to-American in a solemn, uplifting remembrance and commitment to America’s future. The White Plains Candlelight Walk staggered city officials with the streaming turnout filling the broad Main Street boulevard with ranks of 30 to 40 persons shoulder-to-shoulder all the way from the City Hall steps back to Bank Street. 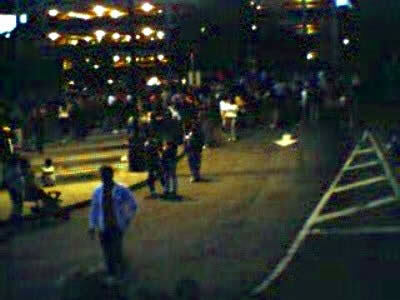 By 7:15 PM the parking lot below the clock tower at the railroad station was filled, and still they came. Every race, every creed. Neighbors greeting each other. Shaking hands. Some carried signs. Some carried flags. Some brought their own candles, but they came. They walked. Pushed strollers. Children did not cry or misbehave. Persons said “Excuse me,” and smiled at each other. They knew this was important. They lit each others’ candles. At 7:35 PM they began to walk slowly south on Bank Street filling the broad cross street with quiet, orderly, confident humanity. For such a large crowd, they were serious and stalwart. Some carried signs reading “Thank You White Plains Bravest and Finest,” and “Thank you Fire and Police.” They sang impromptu versions of “My Country ‘Tis of Thee,” and “The Star-Spangled Banner,” waving their flags. Their spirits were steady. Their pride high. No fear. Their love of country and fellow Americans was glowing. As dusk stole velvetly over the streets with an orange sun receding to the West, traffic on Hamilton Avenue stopped for this long freight train of White Plains citizens. They took 30 minutes to reach City Hall, and still, from this reporter’s vantage, reached back to Bank Street. There was no honking of horns from stopped autombiles. No animosity. Motorists recognized something special: thousands of tentative, yet determined steps of America on the way back were being taken. At the City Hall steps, with Main Street jammed with humanity, a quiet, respectful crowd drew close to the old neo-classic columned brick façade. They waved flags, their candles in their hands glowed like they do at a Meadowlands concert. Mayor Joseph Delfino welcomed the multitudes thanking all for coming, thanking the White Plains firemen and policemen for their efforts the past week, but his remarks were hard to hear. Somehow you did not have to hear them. Everyone understood what he was saying. Everyone felt it, too. I did. The Mayor was surrounded by a host of the White Plains clergy from many churches behind him. The men and women of the cloth had assembled at his call to present an ecumenical service of remembrance and prayer for the victims of the World Trade Center disaster. There was a chorale group and ensemble. But, I cannot tell you who they are at this point. There were no news releases or media briefs at this gathering. No text of the Mayor’s remarks was handed out. He did not make many. It was not that kind of event. It was regretfully special. You did not need to know who was offering the prayers, rabbi or priest, minister or pastor. The different prayers and appropriate hymns rose on the cool early autumn night echoing skyward, warming hearts, and somehow fit splendidly meaningfully together. The White Plains clergy, in this reporter’s opinion, should do this more often under pleasanter circumstances. It was very special and so right. The impromptu public address system could not be heard clearly beyond 100 feet. However, the people of White Plains listened and soaked in the spirit of the sweetly sung entreaties to The Almighty, with no catcalls, no disrespect, dedication and silent endorsement of the message. Children did not cry. The service concluded with the throng singing “We Shall Overcome.” After several moving choruses with the multitude of citizens swaying together, the final stanza which goes “We Shall Stand Together,” closed the old 60s protest song with a roll of applause and cheers. The Mayor said that there was a Remembrance Book in the City Hall rotunda, which would be placed in the White Plains Public Library for all to sign. The Mayor announced this because not all of the thousands could march into the rotunda to sign it that evening, which brought one of the few laughs of the night. The remarkable evening of remembrance and renewal closed with a rousing singing of “God Bless America,” with outstanding voices from the steps of City Hall, helping the citizens out with the second and third verses. They returned to cars, parents pushing strollers, couples arms over shoulders. Old city and county political rivals often adversaries, shook hands on the City Hall steps. Some young persons in their 20s stood in front of the fenced off E J Conroy Drive, and, impromptu, shouted “USA,USA!” Then they changed what they were chanting. They crossed their hearts and began to recite, in unison: “The Pledge of Allegiance to the Flag,” getting every word right with dignity and dedication. You should have been there, but you wished you never had to be. EPILOGUE (Written in 2006): It is seven years since 9-11-01, and the sense of working together has left us. Instead today we see a fractured politicized landscape in which our “leaders” have played upon our fears to restrict the very freedoms that created America and which we stand, or used to stand. Leaders play citizen group off citizen group, use minorities as scapegoats, and sanctimoniously proclaim their patriotism. Most distrubing of all, they pass the buck and refuse to take responsibility, and do not communicate and cover up. It is sobering to see so many weak people elected to office and being selected to run for office, some without even the experience to execute the position. The legacy of America is still there. Whether our “leaders” understand it, I am no longer confident. The job is not to ask what can I get out of my country and government, but what I can do for my country and to improve the way I govern for all not just the connected, the influential and the powerful, and the managerially challenged and whether it will benefit me the officeholder/seeker — and this goes from the Oval Office to every, Governor’s Office, Mayor’s Office, Assemblyperson’s office, State Senator’s office, County Legislator’s office. Your job is not to turn Americans and races and groups against each other but to work for the good of all, please. Comment (2009): The CitizeNetReporter wrote the above epilogue in 2006. It is sobering as we read today’s headlines on September 11, 2009, that it seems I could have written it today, based on events this week. We are still using rhetoric, not leadership, myth not fact, and playing one group off another, and raising fear after fear to win a point. One need only look at the last two weeks of health care debate to realize that. Perhaps we should try and work together instead of working to obtain power and our point of view. Maybe someday. But perhaps never. The more the players at leadership in America change, the more they stay the same, it seems. Observation, 2018: Sadly the trends I noted in 2006 and 2009, have only taken on momentum. We have a selfish, self-centered President. Congress has failed to defend human rights and has chosen to let America’s reputation as the world’s safe haven to refugees for 210 years crash like the horrifying rubble of the collapsing trade center towers. The leaders have stood by, choosing to jail children, separate families, deny access and deport persons here who have long contributed to this country. Fear of immigrants who built this land, is now rampant in the land. Greed is in control. The government has passed tax changes, works for health reform that will only hurt millions. Regulations on the environment, consumer protection and selections of judges for courts are now offered to judges who would restrict the availability of the courts to citizens, and sell their souls for power. America has elected leaders who do not tell the truth or horridly, respect it. Leaders who will not fight for what is right and are without compassion. The legacy if ever there was one of 9-11 has been tragically forgotten in the last 9 years. Americans are no longer together. No longer shoulder to shoulder. A false optimism of prosperity is touted. This everyone for themself attitude needs to be turned around. America has lost its way and is rolling down The Lost Highway. It knows not where it is going. Fingerpointing and hatred are the tools of politics today. Power is worshipped at all costs. New leaders must lead with righteous dignity for liberty and justice for all, and respect for the truth, not prosperity, power, privilege rhetoric for the few.